The day dawned bright and sunny and surprisingly, both of us decided to catch the sunrise at the beach. Ok…Ok.. It was not exactly sunrise time but it was early in comparison with our waking time on holidays. The Arien was a lil worried that we may end up seeing stuff that may forever spoil the beach in our eyes as this was not exactly a private beach – and lots of fishermen lived next to the Resort – Thankfully, nothing untoward had happened, or was happening when we reached the beach. We were the only ones on the beach. The first thing, we noticed was a huge net that was spread across the entire beach. I think the fishermen had finished their first fishing visit already. The beach looked soothing, calm, and so we decided to spend the evening at the beach again. The plan was to proceed to Malpe beach after breakfast at our Resort. We came down to the common area for breakfast a good hour later – to find a hungry cat that kept mewing while walking under the dining table. I have a horror of any moving thing that is under my chair – I usually shriek, scream, and jump out of chair and generally end up creating a scene. Not wanting to embarrass myself or the Arien, I kept an eye out for the cat. The breakfast was cup Idli which resemble Sannas. Sannas are like idlis, only fatter, and are a favorite snack item for mangaloreans – Progrm has brought this for lunch many a time and I have always said “Oh this is Idli” and she wud b like “No – they are called sannas”. Anyways, this guy called it a cup idli. While I was distracted by the cup idli, the hungry cat decided it wanted to eat too and while it thought it was making itself a la puss in boots – I was shocked out and pushed the table with the cup idlis, sambhar dish, and chutney, away frm me so I could get up. The Arien was faster and caught the table so there was no mishap – the cat ran away and I sat down amidst rude stares frm others. I murmurmed a “Sorry” to the table in general and a “Thanks” to the Arien while he was wolfing down the cup Idlis. Was I mad? You bet I was… When I make Idlis at home – they are largely ignored or eaten “naam ke vaasthe” types (I’ll have 1 – Ok I’ll have 2 b’cos you made it -blaaaaah) and here he was gobbling away. The mystery was soon solved – the hungry cat was being fed by the Arien – two birds with one stone!! The whole malpe thing was an amazing fiasco – surprising but true! B’cos of morning drama – we left at 11 a.m. and it was pretty warm – by the time we reached Malpe beach – I did not honestly want to step out of AC vehicle at all. We decided to visit the Paradise Isles Resort that is a sister organization of the Palm Grove Resort – the look was so different – Palm Grove wud b a country cousin in comparison. We had an interesting 1.5 hr roam as we chked their facilities including the rooms, resturants, etc. etc. The young manager was very obliging and this inspite of his knowing that we did not plan to stay at their resort. When we came out of the resort, we realized that both of us were tempted to shift to Paradise Isles – well, we were already off-budget – I did not want us going overboard with this trip and so we convinced ourselves it was ok to guz this tempting offer and go on to St. Mary’s Isles. This picture was taken from the Malpe beach. When we reached the destination where boat rides were arranged, we were told that there was no way we could go to St. Mary’s Isles as the boat would move only at capacity (arnd 60 ppl) or we pay as much so we can go there. Plus, being a weekday, there won’t b so many ppl going on tht ride at this point of time, the ticket checker happily informed us – making it clear that waiting was not going to help. I remember a comment made by a dear friend, who had been there almost a year ago, the essence of which was – missing the St. Mary’s Isles was no beeg deal- and so that is the only snap of that location. Our plan was to head to Woodlands at Udipi again – I was tempted to suggest eating at the resort so we didn’t have to drive to Udipi but knowing the Arien – I knew it was well and truly a wasted initiative – it wud be best if I drop all plans of lazing and got dressed for dinner at Woodlands. The entrance to Udipi was totally lit up and looked awe-inspiring yet again. We decided to visit the temple this time. First surprise was to see the A/C inside the temple. Both of us were pleasantly surprised at that. I was sure that was new. My memories had indeed served me right – there was an in-house kolam inside the temple – I can still recall how we were pushed, pulled, dragged, and shoved when I had been here with my family, a loong time ago. The experience was distinctly different this time around – maybe b’cos I was a lot older or maybe b’cos it wasn’t as crowded. Whtever the reason – I felt calm. The place was lit up like day before and there was this balloon man who was claiming all the attention of the kids. He appeared impressed that we were taking his snap and struck a nonchalant pose. Udipi looked lovely and I was jes thinking that I would have missed this, had I decided to stay back at the resort and I was really thnkful to the Arien for this visit. Dinner at Woodlands was ok – did not damage our budget – but did not help it either – the place was xtremely popular by the number of ppl waiting and the quick service – it reminded me of Shanthi Saagar during the weekends. We had a quick dinner and the Arien looked pretty tired too and so we decided to get back to the resort – we were going to Belur, Halebid tomorrow – if all goes well and according to plan. As we left Udipi, the one thing that stayed with us was the festive look. When we reached the resort, we were totally tired out and ready to crash. We planned to leave post breakfast so we could cover quite a few places of interest on the way rather than move from Point A to Point B. End of Day 5! Deciding to visit Udipi was an afterthought – one that we debated as we drove out of Plam Grove resort. There were two resturants that were pretty close to each other and before we could blink, we had crossed them. The Arien had decided – we were going to visit Udipi. As we entered Car Street, I was amazed at the activity in front of us – there were zillion lights all-arnd. 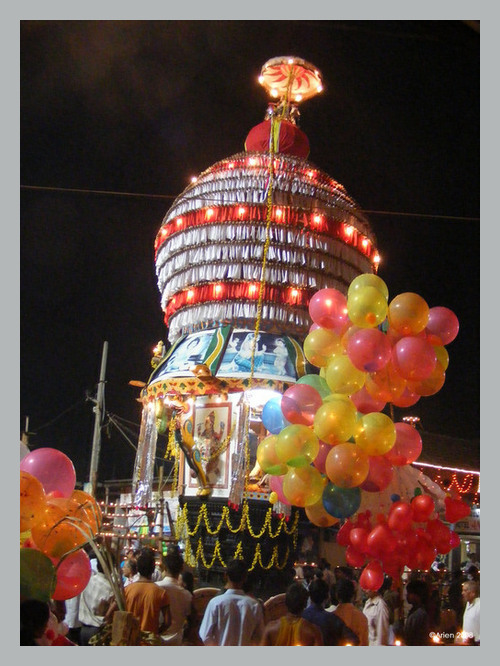 I speak to a local and am informed that today is the Lakshadeepanthara festival. The crowd looked scary and I was worried ’bout our backpack that contained the camera, purse/vallet, etc. etc. We needn’t have worried – ppl had come to see the lord. Anyways, we decided to watch the goings on before having dinner. I feel xtremely lucky that we have come at this time. 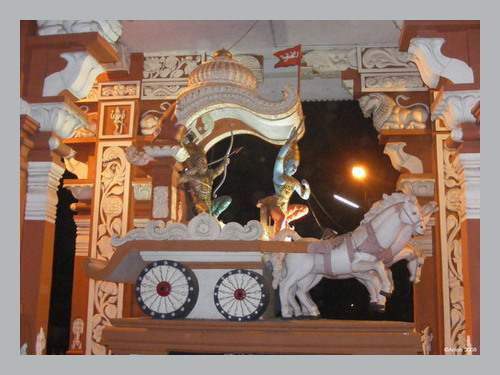 Suddenly, we see the temple chariot or Kovil Ratham, travelling towards us, I urge the Arien to take the camera out and shoot a picture. The entire place holds a festive look and there are people selling balloons, bhel puri, idols of the god in all shapes, sizes, and materials – I feel like I was at a Jaathre. After wolfing down the Goli Bhajji, we decided to have what was written in the menu as an Outlook Dosa. 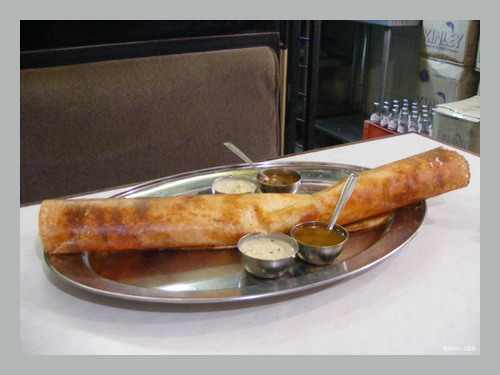 We happily ordered for two outlook dosas. The waiter asked us to order one and after we finish, we could order another one. We said OK. I was curious until the dosa arrived. It is so huge – that finishing two was going to be impossible. I was pretty impressed by his thoughtfulness. I decided to have a vanilla shake and the Arien chose to have a Coffee. The bill came to less than Rs. 100/- We both grinned from ear-to-ear – we were going to b back on budget and we may actually be able to be within the limit… YIPPEEE! !